To be truly effective and easy-to-use, the best instrumentation requires powerful and intuitive software for data acquisition and image processing. 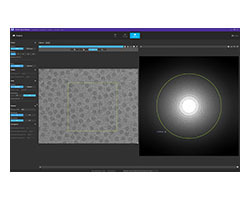 Besides our continual push for innovation in TEM hardware, Direct Electron also invests heavily in developing and improving software tools related to TEM imaging. Our philosophy is to deliver the latest software tools with as much flexibility as possible so you can acquire and process your data as needed to accomplish your scientific goals.